St. Colette was born Nicole Boellet, in Corbie, France. Her father was a poor carpenter at the Benedictine Abbey of Corbie. Tradition tells us that her parents were without children, and after having prayed to St. Nicholas for help in having a child, their prayers were answered. Her mother Marguerite gave birth to a daughter, Nicole at the age of 60. Out of gratitude, they named the baby after the saint to whom they credited the miracle of her birth. Her family and friends called Nicole, Colette, a derivative of St. Nicholas. After her parents died in 1399, Colette joined the Beguines Order, but found their manner of life unchallenging. She received the habit of the Third Order of St. Francis in 1402, and became a hermit under the direction of the Abbot of Corbie. She remained a hermit for four years, and after several dreams and visions, she came to believe that she was being called to reform the Franciscan Second Order, and to return it to its original Franciscan ideals of absolute poverty and austerity. Pope Benedict XIII of Avignon received her in France, and allowed her to transfer to the Order of the Poor Clares. He empowered her to found new Monasteries and to complete the reform of the Order. In 1410, she opened her first monastery at Besancon, in an almost abandoned house of Urbanist Poor Clares. From there, her reform spread to Auzonne, Poligny, Ghent, Heidelberg, Amiens, Pont-a-Mousson, Lorraine and other communities of the Poor Clares. She founded 18 Monasteries of her reform during her lifetime. Her reform prescribed extreme poverty, going barefoot, and the observance of perpetual fasting and abstinence. In addition to the strict rules of the Poor Clares, the Colettines follow their special Constitutions. St. Colette also developed a reform among the Franciscan Friars known as the Coletans. These friars formed a unique branch of the Order of the Friars Minor. They had thirteen friaries and attached them to the monasteries of the Colettine Nuns. St. Colette was known for her miracles, and according to tradition, a local peasant woman gave birth to a stillborn child. In desperation, out of fear for the child’s soul, the father took the baby to the local Parish Priest for baptism. Seeing that the child was already dead, the Priest refused to baptize the body. The father became insistent and the priest told him to go to the Nuns. When he arrived at the monastery, Mother Colette was made aware of his situation. She was given the Veil she wore, by the Pope, and took it off. She wrapped the child’s body into it, and told the father to return the child to the Priest. By the time he arrived at the Parish Church with his dead baby, the child was conscious and crying. The Priest immediately baptized the baby. St. Colette died at Ghent, in March 1477. She was beatified in 1740 by Pope Clement XII and was canonized in 1807 by Pope Pius VII. The Colettine Nuns are currently found in Belgium, Germany, Ireland, Japan, Norway, the Philippines, Spain, throughout the United Kingdom and the United States. St. Colette was born in 1381, and lost her parents at the age of seventeen. She was a spiritual child, and was named after St. Nicholas. Her parents were childless, and after having prayed to St. Nicholas, her mother gave birth to her at the age of sixty. She entered the religious life and became a hermit. After many dreams and visions, she felt God had called her to reform the Poor Clares. She was received into the Poor Clares and was not only to reform them, but was given the task of founding new monasteries. She founded seventeen convents with the reformed rule and reformed several older convents. She was renowned for her sanctity, ecstasies, and visions of the Passion of our Lord. She even prophesied her own death in her Convent at Ghent, Belgium. A branch of the Poor Clares is still known today as the Colettine Sisters. 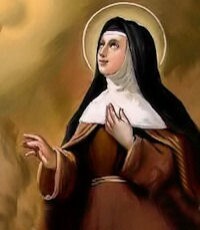 She was canonized in 1807, and her feast day is March 6th.